Get this versatile & features packed Wireless IP Camera for your home or office at our best value price. This IP Camera is super easy to setup and supports Peer-to-Peer connection technology unlike other lesser IP cameras. It also supports viewing from your smartphone or any other web browser capable devices like your tablets, PCs or even your MAC. It can be used for many different scenarios like home security, baby monitoring interaction. Keep your home secure with its web based remote viewing and Motion Detection functions that supports email alerts with attached photos. You can even monitor and soothe your baby with the 2 way audio-mic function. 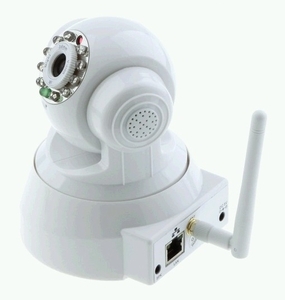 Or just use this multi-function camera as part of your home automation setup.